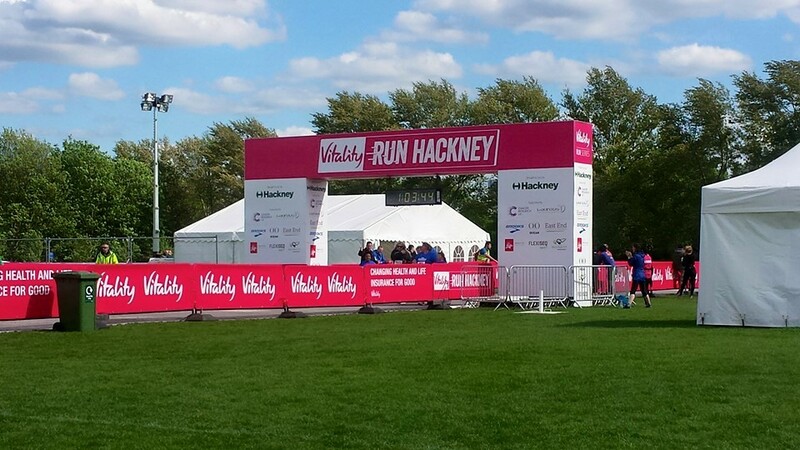 In it’s second year, this weekend is the new home for the Vitality Run Hackney Half Marathon and the 5km which takes place the day before. The 5km is billed as a community event, to get those involved in the weekend who don’t quite feel ready for 21km yet. It’s also free which makes it accessible to everyone and you still get the same race experience with a medal, water etc. I was umming, and ahhhhing about this event when the day came. I went into town for the Spin LDN show then did a bit of walking around to get some pictures for a project which made me run a little behind schedule. I figured if I got to the station in time, I’d go run, if not, I’d stay on the train and go home. I made it. The Start: I did have to rush a little, but there were no queues or crowds; everyone was busy getting warmed up and then settling into the staring pen. I quickly joined the back of the starting pen after dropping my bag off and a quick loo stop. I got my TomTom ready and before I knew it, it was 3pm and we were off. 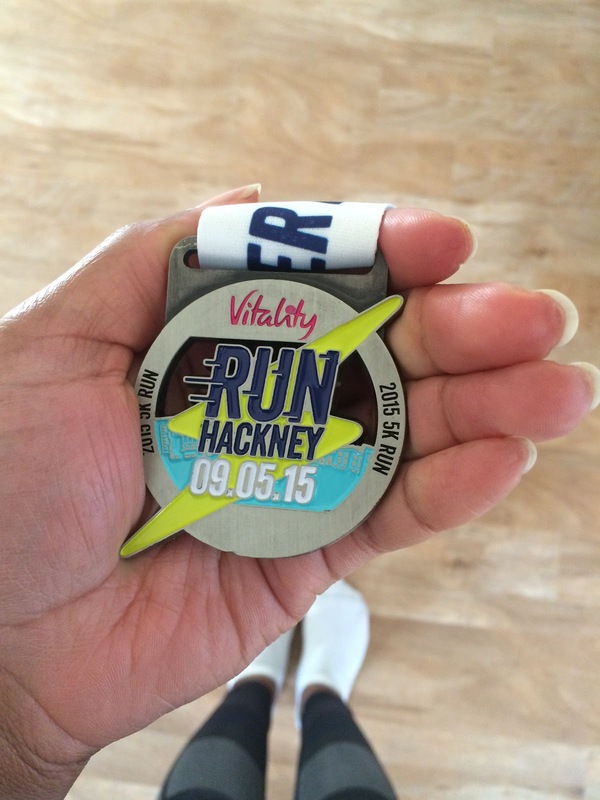 The Route: All set in Hackney Marshes so this was a novelty for me! 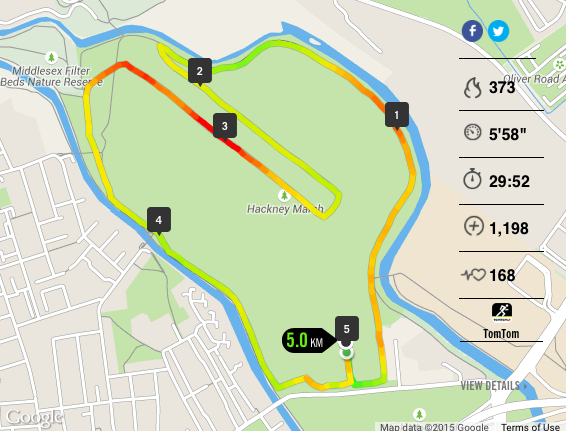 It did mean that half the course was on the pavement and half on grass (not my favourite). Overall, it was a great route though, even if a little narrow (this could have been resolved by starting us in two little waves). I enjoyed looking into the distance to see where I would be running! 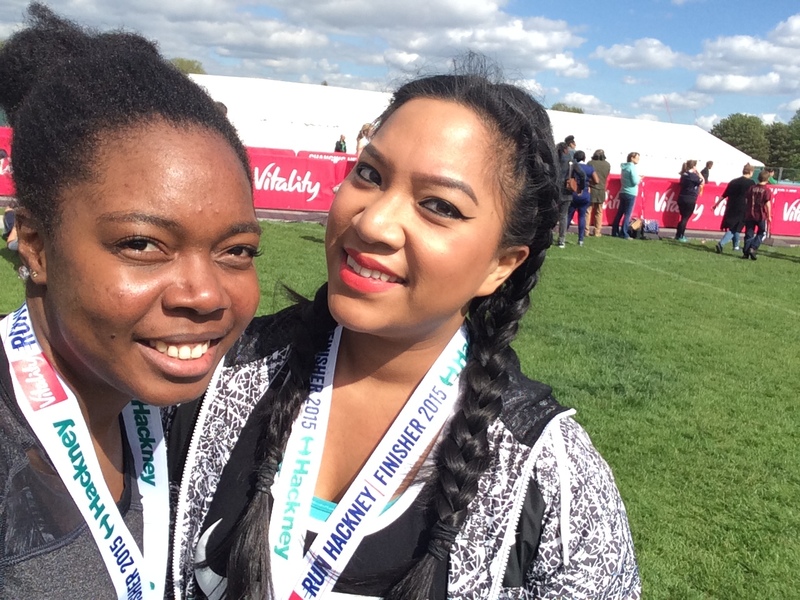 The Atmosphere: It was a great event, and the perfect day for running with spells of sunshine and a cooling wind. Everyone on the course was friendly with most chatting away (or was that just me?!). There were lots of friendly faces I knew which made it so much more fun getting to catch up briefly! The Medal: The main reason I was motivated to run and it was definitely worth it! I’m now looking forward to my medal tomorrow even more which I hope is different to today (that was some of the feedback from 2014). So my legs got their shakeout run; 5km in under 30 minutes. I think I went a bit wild! But I was in it for the EXPERIENCE and the same will be said for the half marathon even though it will hurt more! So, catch me at the finish line! Sounds like fun. Good luck with the half marathon tomorrow! Thanks 🙂 HM post coming later this week! Interesting – a 3PM race. Was it hot? I have done one evening race and then a relay where we ran at odd times. It is a very different race day routine. Nice job! I think it works well if you like to eat 🙂 plenty of time to get fuelled and hydrated! Also, if they're encouraging people who wouldn't normally run, I guess they don't wanna put them off from the get go with an early start! or when it gets posted… lol!